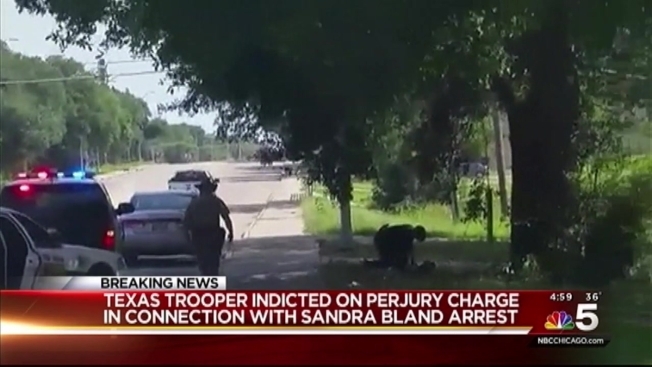 The Texas Department of Public Safety says it will fire the trooper indicted for perjury related to his traffic stop and arrest of Sandra Bland, a black woman who died three days later in jail. The department said in a statement Wednesday that it would "begin termination proceedings" against Brian Encinia. Encinia was indicted earlier Wednesday for allegedly lying in an affidavit about the July traffic stop in which he arrested Bland. The Waller County Grand Jury indicted Trooper Brian Encinia with the misdemeanor count, alleging he lied about how he removed 28-year-old Sandra Bland from her vehicle during the July traffic stop. The same grand jury decided last month not to indict any sheriff's officials or jailers in Bland's death, which was ruled a suicide. "We really didn't expect anything, we just presented the evidence," Special Prosecutor Shawn McDonald said. Bland remained jailed following her arrest because she couldn't raise about $500 for bail. Encinia, who has been on paid desk duty since Bland was found dead in her jail cell, also faces a wrongful death lawsuit filed by Bland's family. The misdemeanor charge carries a maximum penalty of a year in jail and a $4,000 fine. A team of special prosecutors presented evidence before the same Waller County jurors who last month declined to indict anyone in Bland's death. The 28-year-old woman was found with a plastic bag tied around her neck in her cell at the jail about 50 miles northwest of Houston. A medical examiner ruled her death a suicide. Encinia has been on administrative leave since Bland's death. Texas Department of Public Safety Director Steve McCraw has said Encinia violated internal policies of professionalism and courtesy during the traffic stop, which he made because Bland had made an improper lane change. Dashcam video shows the traffic stop quickly became confrontational, with Encinia holding a stun gun and yelling, "I will light you up!" after Bland refused to get out of her car. Encinia is accused of lying about how he removed Bland from her vehicle. Geneva Reed-Veal, Bland's mother, has filed a wrongful death lawsuit in federal court in Houston against Encinia, the Department of Public Safety, Waller County and two jail employees. A judge set a January 2017 trial date in that case. Cannon Lambert, an attorney for Bland's family, said the grand jury's decision is consistent with what the family believes has been an attempt by authorities to cover up what transpired after Bland's arrest. They also have questioned the medical examiner's determination that Bland committed suicide in her cell by hanging herself with a plastic garbage bag.